A couple of years ago, I posted about a manly trend of wearing beads. I have to say, I loved it then and I love it now. It's nice to see a good bracelet or necklace on a guy, which is why I was a quick fan of ByJodi based in Alpharetta, Georgia. Jodi Gonsman creates some really beautiful pieces for men. Like many an artist, she is very particular in her craft, the materials she sources and works tirelessly to get it 'right' each time. Jodi, "I spend more time than most making sure that every detail is perfect." 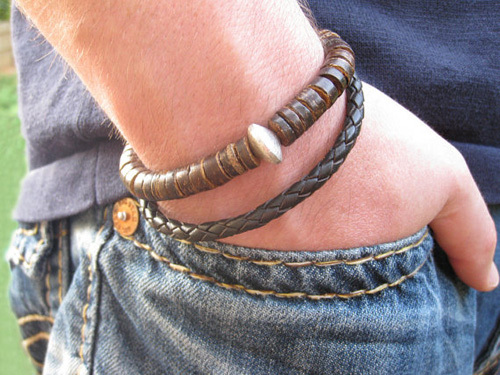 What I like too is how men can mix and match, as these bracelets go so well stacked together. The men's bead gemstone bracelet may just be my favorite. 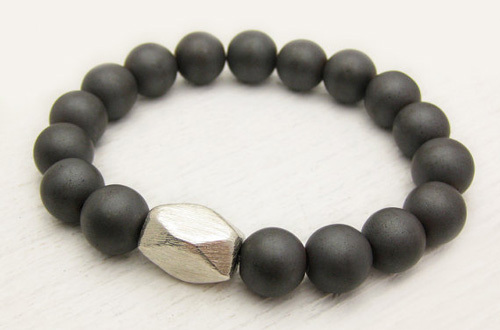 The masculine matte hematite is a great feature. As Jodi explains, "I have never seen anything like it. Normally hematite has a shiny, silver-like metallic look to it. This is just cool." And to make it even cooler, she added a nuts and bolts style, sterling silver bead to give it focus and added texture. These beaded and braided creations are part of a manly trend that I hope continues for at least a couple more years. Check out the ByJodi shop, here, which includes hundreds of gorgeous jewels for the women too.